CINEMA STYLE OCEAN VIEW! Majestic Sun 1012B. Stunning Space. Free Beach Service! Why go to the beach unless you have a spectacular view of the ocean? Offered by Coastline Condos, this 10th floor condo has a stunning penthouse view. Don't settle for a 'partial' view of the Gulf -- stay with us and see the ocean 24/7. Enjoy FREE beach service every day of your stay! Now's the time to plan your long awaited vacation! You can enjoy the perfect vacation destination! Stay with us at Majestic Sun. Nearby shopping, on-site golf and tennis, indoor and outdoor pools, exercise facility, 6 miles of ocean front walking and biking and the most beautiful sugar-white beaches in the world. As you step into this tastefully decorated NON-SMOKING retreat, you'll sense you have arrived at your perfect vacation destination. Here you will relax with a breathtaking view of the emerald green gulf waters from the panoramic 10th floor location. From the Master suite you'll enjoy a beautiful view of the manicured lake, pristine golf course and the Choctawatchee Bay in the distance. For winter rentals, we guarantee beautiful sunset views. * Shop till you drop at 100 stores in the Silver Sands Outlet Mall! * A tastefully decorated lobby to meet up with your friends for dinner, or to just relax with a magazine. Whale's Tail, Pompano Joe's, The Crab Trap, Copper Grill, Buster's Oyster Bar and Grill, Cuvee Beach Cellar, the elegant Elephant Walk at Sandestin, Cancun's Mexican, Ocean Club, Theo's Pizza, Sunset Bay Cafe, and Fudpuckers. Try the new Bonefish Grill near the Commons for excellent seafood and atmosphere. Hi! We're a husband and wife team and have been managing properties in Destin since 2002. We pride ourselves on the friendliest personal service you'll find. 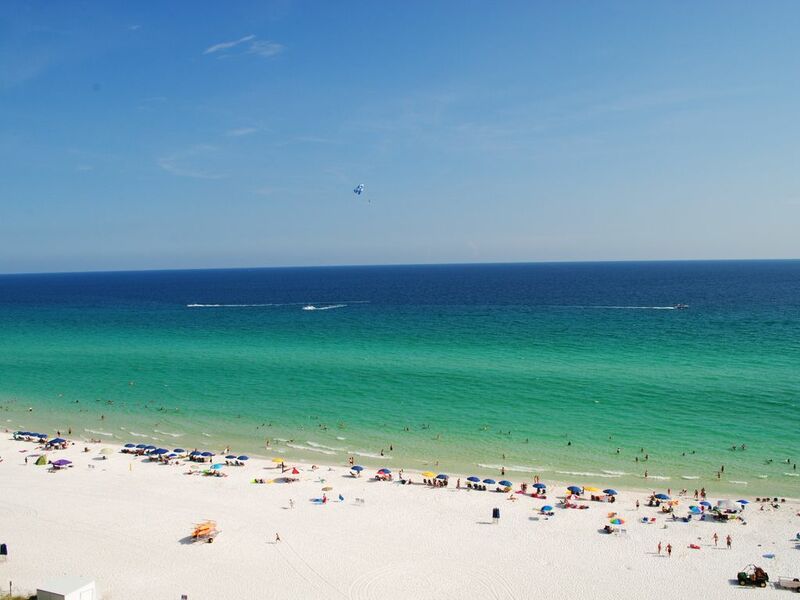 Come stay with us in Destin! We fell in love with the ocean view and the condo was the perfect size and space for us. It was nicely decorated when we bought and has since been upgraded. 6 miles of oceanfront walking. New boardwalk across front of property. Short walk to Whale's Tail restaurant directly on the beach. FREE Beach Service for guests at this condo. toilet, combination tub/shower, Twin sinks in Master Bath. toilet, combination tub/shower, Adjoins the 2nd Bedroom for convenience. Only steps to the beach! Beautiful of Stewart Lake from the opposite side of the building. Nicely equipped exercise room overlooks ocean and pool. Spectacular penthouse view. New furnishings. Comfortable furniture! Overlooks the gorgeous ocean! Available for rent from the beach service. Several courts located on the property. Situated on Seascape Golf Course. Great view and beautiful indoor outdoor pool! Clean, quiet, perfect location to the beach! We really enjoyed our stay here. The place was very clean and quiet. Perfect for 4-6 people. We loved the view! Just awesome! The indoor/outdoor pool was beautiful and the access to the beach was perfect. We even appreciated the convenient store downstairs that had everything you might need. And we had easy access within walking distance to bars, restaurants and other activities. Wonderful experience! Beautiful clean beach. Condominium was clean and nicely furnished; I would stay here again. The condominium was clean, fully furnished and spacious. The balcony is spacious and over looks the ocean; beautiful views and susets. There are plenty of places to eat near by. My family and I, had a wonderful experience. The place was wonderful with awesome views. Although the only downfall was finding the provided beach chairs was kind of confusing. Majestic Sun is a great place to stay with an awesome indoor/outdoor pool and beach within a five minute walk. This particular unit had a great view of the beach including sunsets. A nicely furnished unit and the owners communicated very well with check-in/check-out instructions and general condo needs. Great location for good restaurants in the area. Would recommend some additional amenities for the condo unit including basic food staple items for the kitchen beyond the salt/pepper provided. For the bathrooms, would seek to provide additional items other than sample/travel size of body wash. Many of the condos I have stayed in will now include sample size items of body wash, face wash and shampoo and feel it really makes a difference. I think these things would really help the overall experience for the condo renter. We truly enjoyed our stay! The kids enjoyed their our room. This allowed everyone to have their own space. The view from the deck is amazing. The location is convenient which is directly across the street from the beach.